What's Your St. Vincent & the Grenadines Style? Unless you’re a yachtie, rock star, or fan of the Pirates of the Caribbean movies, St. Vincent and the Grenadines may fall slightly off your travel radar. Here’s a primer: This Caribbean nation is located in the Windward Islands near Barbados, St. Lucia, and Grenada. 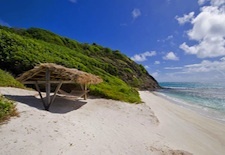 It’s comprised of 32 islands and cays (just eight of them are inhabited), including ultra-chic Mustique – where a who’s who of royalty and rock stars, from Prince William to Mick Jagger, enjoy their rum and sun – and minuscule Mopion (shown at left), a mere sandbar made for two. And its pristine waters and white-sand cays make an ideal backdrop for a breezy sailing adventure or a movie shoot (yes, Johnny Depp as Captain Jack Sparrow frolicked in SVG’s Tobago Cays). Like Socializing? 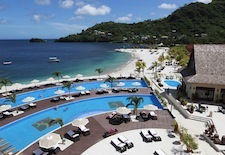 Stay at Buccament Bay Resort on St. Vincent. If you love spending hours lazing in a comfy chaise with a good book, but also crave social interaction, sports programs, multiple dining venues, live entertainment – and even a chance to be coached by acclaimed professional theater vocalists – check out Buccament Bay Resort, a new 100-villa (soon to be 125) all-inclusive resort on the main island of St. Vincent. The property, tucked into a bay-fringed valley against a panorama of green peaks, has a sophisticated, exotic ambience with architecture and lily pond-studded landscaping that at times seems plucked from Thailand. 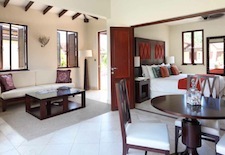 The one-bedroom villas (shown above) are a spacious 850 square feet with clean, contemporary decor in pleasing color combos such as deep purple and pale green or burnt orange and light teal, a plush king-size bed, an airy bathroom (some have showers only, so request one with a bathtub, too, if you'd like a relaxing soak), a 40-inch LCD TV, an iPod dock, and a deck with a private plunge pool (some are more private than others, so if you know you’ll be soaking quite a bit à deux, request a villa with a secluded deck). Away from your villa, you’ll be drawn to the two-level, crescent-shaped infinity pool overlooking the white-sand beach (shown at left). The resort’s social hub, the pool deck is also home to The Bay Beach Club, an open-air bar and restaurant serving excellent international cuisine (don’t miss the truffle risotto), as well as Ginger & Co. Sushi Bar (for a light lunch or snack) and HQ (for espressos, pastries, and ice cream). Two additional restaurants are set in other areas: Bamboo, serving buffet-style breakfast, lunch, and dinner; and Safran, serving vibrant and flavorful Indian cuisine. Over the next year or so, three additional eateries will join the collection: Jack’s in March 2012 (for wood-grilled steak and seafood), Trader Vic’s by late 2012 (the legendary tiki bar/eatery for Mai Tais and Pacific Island/Asian cuisine), and Arlecchino by 2013 (for traditional Italian with a modern twist). To burn off all those calories, you can opt to hit the fitness center or head to the Harlequin Sports Academy for expert soccer and tennis coaching via the Liverpool Football Club Soccer School ($60 for 45 minutes) or the Pat Cash Tennis Academy (group coaching is $225 for five 90-minute sessions, individual is $90 for 45 minutes). Or, flex your vocal muscles at the one-of-a-kind Harlequin Performing Arts Academy, which is under the guidance of a revolving troupe of professional performers, headed by West End and Broadway veterans Michael McCarthy and Stephen Hill (private voice lessons $70 for 45 minutes, four-day group master class $225). Rounding out the amenities are the Indigo Dive program, a serene Spa by ESPA, and a variety of day excursions including a Mustique and Bequia cruise with a lunch stop at Basil’s Bar ($150 per person). Rates start at $1,434/night for two, including meals, beverages, and connecting airfare from Barbados. Like Seclusion? Stay on Petit St. Vincent. It takes a few flights and a 30-minute boat transfer from Union Island to get here, but if low-tech, high-luxury alone time is your thing, then this is the spot. Spoiling seclusion-seekers since 1968, Petit St. Vincent is a 115-acre private island fringed with six beautiful beaches and dotted with 22 one- and two-bedroom retro-chic cottages built with wood and stone from the island. Fresh from a multimillion-dollar renovation by the resort’s new owners, the cottages have been refreshingly updated – expect airy interiors (shown above) with whitewashed wooden ceilings and craggy stone walls accented by sleek teak furniture, simple raffia rugs, abstract seascape paintings, and touches of vibrant blues and greens in blankets and throw pillows. Air conditioning has been added and the bathrooms have been modernized with double sinks, new showers, and plush towels. Honoring a promise to keep Petit St. Vincent unplugged, the owners did not add TVs, Internet access, or telephones (although my BlackBerry worked in my cottage – number 3, located atop the bluff). There is an iPod dock and wireless phones are on order, but they will only connect with reception as a technological assist, in case of an emergency, for example. Since seclusion is the most sought-after amenity at PSV, it’s vital to choose the right cottage – either on the beach or atop the bluff. If you are water-lovers, opt for beachfront (shown at left) as there’s not a single pool at the resort and by booking beachfront you’ll be just steps away from the sand. 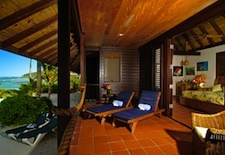 Cottages number 12 through 19 are one-bedrooms on the beach (number 17 even has its own private beach). If a view trumps easy beach access, opt for Cottages number 1 through 5, located on the bluff (I adored number 3 with its panoramic view, 24/7 breezes, hammock for two, and utter privacy). 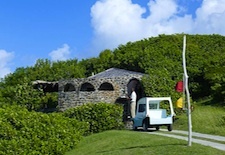 You can always head to the beach or to the restaurant by raising the yellow flag out front (red means “do not disturb”) and a staffer in a retrofitted Mini Moke (a vehicle made on the island for the past 44 years) will come by and drive you there. Of course, you can always order room service (shown at right) and enjoy total privacy for an entire day, a few days, or even a whole week. The renovation also added a barefoot casual beach bar/restaurant (serving light lunches daily and barbecue buffets on select nights), a new wine cellar and outdoor dining deck in the Main Restaurant, and a rustic-style spa, featuring four tree house-type treatment rooms and staffed by a team from Bali. Dining wise, there’s a three-course dinner menu that changes nightly and offers three appetizers and entrees (always featuring fish, meat, and vegetarian options), as well as desserts. Change things up at lunchtime by scheduling a private picnic anywhere of your choosing on PSV, or be adventurous and get dropped off on Mopion, that tiny sandbar pictured above with nothing but an umbrella and stellar sea views. One-bedroom rates start at $1,350/night, including meals ($1,050 after May 1, 2012). Like a Bit of Both? Stay on Palm Island. For that private island experience but with a bit more of a social ambience and a wider array of activities, consider Palm Island, another private-island enclave ringed with beaches and featuring 43 rooms set in double cottages, as well as a pool, tennis courts, a nine-hole golf course, and two restaurants and bars. Decor is classic Caribbean (rattan furnishings, floral fabrics, no TVs or Internet) and while I didn’t stay here and couldn’t see rooms during my tour (all were occupied), the five Island Lofts (shown at left) are designed for couples and offer queen- or king-size beds, deep-soaking tubs, and terraces with ocean views. Rates start at $910/night, all-inclusive. e Off-the-Beaten-Path? 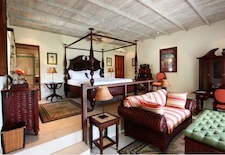 Stay at Bequia Beach Hotel on Bequia. If your style is to stay at small, quiet, independently owned resorts while absorbing local flavor in a totally non-touristy way, check out the relaxing ambience and great value offered by Bequia Beach Hotel, a new property featuring 36 rooms and suites and six villas. Built on pretty Friendship Beach by Bengt Mortstedt, a Swedish expat who fell in love with unspoiled Bequia, it features two pools, two restaurants, and inviting tropical-chic interior decor (four-poster mahogany beds and furnishings by Tommy Bahama) topped off by relaxing private terraces with water views. Two standout categories I noted during my tour: the 700-square-foot Ocean View Suites (shown above right) and Beachfront Suites (from $350/night). It’s a lovely spot to relax with a good book and swap anecdotes with other independent-minded travelers. Rates start at $195/night. See our St. Vincent & the Grenadines Travel Guide for more trip-planning information, then use our Travel Search price comparison tool to find the lowest rate on flights, hotels, packages, and more travel deals.